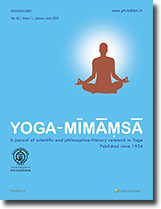 Yoga Mīmāṃsā (YM), the Semiannual publication of Kaivalyadhama (www.kdham.com), is the oldest (since 1924) peer-reviewed multi-disciplinary research journal on yoga. YM is now available as a print + online journal, and allows free access (open-access) to its full-text in HTML and permits authors to self-archive final accepted version of the articles on any OAI-compliant institutional / subject-based repository. YM does not charge for submission, processing or publication of manuscripts.